Book launch parties and upcoming readings by our authors. ONE BIG SMALL PRESS BLOCK PARTY. Buy books. Party with publishers. Celebrate independent and international literature. Join CLMP and over 55 small publishers for a big small press block party during the PEN World Voices Festival. From 4 – 8 PM on Friday, May 5, 2017, publishers, editors and writers will converge on the Washington Square Mews to celebrate independent and international literature. Books and literary magazines will be on sale; participants can also enjoy author signings, live performances, opportunities to write, and literary readings. Lit Crawl NYC kicks off in and around the Washington Square Mews starting at 6PM. PRESS FEST! is free and open to the public. Follow PRESS FEST! on Facebook! This entry was posted in Events on May 2, 2017 by smp. You can now order Terence Degnan’s Still Something Rattles, a concept book of poems broken into three chapters; Letters From Purgatory, Unicorn, and Rome. This limited edition is encased by a hand-made, wooden sleeve, and branded by a custom logo representing all three chapters. Still Something Rattles is available from Sock Monkey Press as of September 25, 2016. This entry was posted in Events and tagged book release, brooklyn, jalopy theatre, red hook, sock monkey press on August 4, 2016 by smp. Sock Monkey Press poets Nicole Callihan and Terence Degnan will be presenting: ‘Deconstructing the Poem by Telling the Poem’s Narrative’ at Pike Brewery during the 2014 AWP Annual Conference. The event will take place on Friday, February 28th and will commence with a brewery tour at 2:30pm sharp. Two special guests of Nicole and Terence will be telling the stories behind the poems. Nicole will be fresh from her 2014 book release at Poets House in NYC, and will be kicking off her book tour at AWP. Both will have their respective books on hand, published by Sock Monkey Press in 2012 and 2014 (Terence: The Small Plot Beside the Ventriloquist’s Grave, Nicole: SUPERLOOP). Pike brewery and their staff will be leading guests of Sock Monkey Press on a tour of the brewery prior to the reading promptly at 2:30PM. Pike is excited to be hosting the event and their guests, and welcomes all visitors to the Seattle area attending the 2014 AWP Writing Conference. Pike Brewing Co. is located five blocks from the Seattle Sheraton on Pike St. at 1415 1st AVE. The Association of Writers & Writing Programs holds the largest literary conference each year in a different city. This year’s event will be at the Washington State Convention Center & Sheraton Seattle Hotel from February 26 – March 1, 2014, however many events will be taking place at off-site locations. This entry was posted in Events on February 25, 2014 by smp. Order your copy of SuperLoop. Read Cleaver Magazine Anna Strong’s review. This entry was posted in Events on October 1, 2013 by smp. 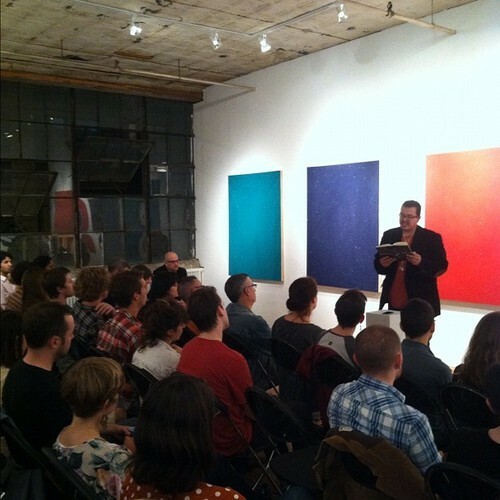 Thank you Open Source Gallery for hosting our upcoming poetry reading with Terence Degnan [A Small Plot Beside the Ventriloquist’s Grave], Nicole Callihan [forthcoming Super Loop], Jack Wilson [Enter to Exit (ep) – checkit! ], and Margaret Coe [debut]. Nicole Callihan writes poems, stories and essays. Her work has appeared in, among others, Painted Bride Quarterly, Salt Hill, New York Quarterly, North American Review and Cream City Review and has been translated into German and Spanish. A Senior Language Lecturer at New York University, she lives in Brooklyn with her husband and daughters. Her first book of poems, Super Loop, will be published (woohoo!) by Sock Monkey Press (double woohoo!) in early 2014. Terence Degnan is a poet and spoken word artist. His work is published in various literary magazines including Prime Number Magazine, The Other Herald, The Front Weekly and the OWS Poetry Anthology. His two spoken word albums, 2008′s BC & 2010’s Calling Shotgun were produced in Pittsburgh, PA, and Raleigh, NC, respectively. The Small Plot Beside the Ventriloquist’s Grave is Degnan’s first published collection of poetry. He lives in Brooklyn with his wife and daughter. When she was three, Margaret Coe announced that she planned to join the circus. This went on for many years and included interesting ropes hanging from backyard trees as well as various costumes and acrobatics and attempts at juggling—even a short stint of balancing peacock feathers on her nose. Imagine her parent’s relief when they could relinquish their fears of her walking a tightrope and instead hunker down with a nice cup of coffee and read the wonderful poems that began pouring out of her. Margaret is excited about starting college next year and embarking on her career as a writer. This entry was posted in Events on September 19, 2013 by smp. Join us for a reading, a Q&A, a book signing, and delicious wine. In Home Front, we find stories as diverse, irreverent and grittily lyrical as the metropolis they all ultimately celebrate. It is a striking debut, filled with narratives at once familiar and strange, and characters both tough-as-nails and yet tender. Martin Kleinman has written New York City a love song no New Yorker will likely soon forget. Order your copy of Home Front, a collection of short fiction by Martin Kleinman. Each piece is steeped in the lore of 20th century New York City street life that, while harsh if not downright dangerous, is fondly remembered by older and ex-pat NY’ers–and virtually unknown to legions of newcomers. Martin Kleinman is a New York City story teller. He has captivated audiences with his tales of real New Yorkers in New York venues from KGB Bar to Union Hall. He lives in the northwest Bronx, from where he can survey the full length and breadth of the world’s greatest metropolis. This entry was posted in Events on June 4, 2013 by smp. We are hosting a reading Thursday March 7th at Mass Ave Tavern from 2p – 4p (94 Mass. Ave). Just a 5 minute walk from the Hynes Convention Center. Seven incredible Brooklyn Writers representing Crumpled Press, Press 53, Ugly Ducking Press, Tin House, and Sock Monkey Press will read new or recently published work. The readers are Lauren Belski, Nicole Callihan, Kate Hill Cantrill, Corina Copp, Terence Degnan, Martin Kleinman, and Elissa Schappell. LAUREN BELSKI is the author of Whatever Used to Grow Around Here (Crumpled Press, 2012) and also the collective collection of fiction, The Trout Family Almanac (forthcoming, Papercut Press, 2013). Her work has appeared in StoryQuarterly, J: New Writing on Justice, The Rio Grande Review, and other literary fun mags. Though now a Brooklynite, she once lived in Boston in the summer of 2002 and worked as a barista at Trident Booksellers and also as a tour guide at the JFK Museum and Library. That was the last time she set foot in this city. And it was such a long time ago she can barely remember herself. NICOLE CALLIHAN, formerly Nicole Hefner, writes poems, stories and essays. Her work has appeared in, among others, Painted Bride Quarterly, Salt Hill, New York Quarterly, North American Review and cream city review and has been translated into German and Spanish. A finalist for the Iowa Review’s Award for Literary Nonfiction, she was named as Notable Reading for Best American Non-required Reading and awarded Best of the Net 2010 for fiction. In addition, Nicole was a contributor to Playing with Poems, an educational textbook published by Heinemann, and is a frequent contributor to Teachers & Writers Magazine. She has received grants from the Ludwig Vogelstein Foundation and from the Rockefeller Institute and is a founding member of the Brooklyn Writers Collaborative. Her book, Henry River Mill Village, which she co-authored with Ruby Young Keller was published by Arcadia Press in July 2012. Currently a teaching artist with Teachers & Writers Collaborative, as well as, a full-time Language Lecturer at New York University where she has received an Excellence in Teaching Award every year since she began in 2002, Nicole lives in Brooklyn with her husband and daughters. KATE HILL CANTRILL‘S writing has appeared in various literary publications, including Story Quarterly, Salt Hill, The Believer, Blackbird, QuickFiction, Mississippi Review, Smokelong Quarterly, Swink, Wigleaf and others. She has been awarded fellowships from the Corporation of Yaddo, the Jentel Artists Residency, the Virginia Center for Creative Arts, and the James A. Michener Fund. She has taught fiction writing at The University of the Arts, The University of Texas, and the Sackett Street Workshop. She curates the Rabbit Tales reading and performance series in DUMBO, Brooklyn and she recently published her first story collection, Walk Back From Monkey School from Press 53. CORINA COPP is most recently the author of Miracle Mare (Trafficker 2013), and Pro Magenta/Be Met (Ugly Duckling Presse 2011), with publications forthcoming from Bad Press and Minutes Books. Poetry, performance texts, and critical writing can be found at SFMOMA’s Open Space, The Claudius App, The Cambridge Literary Review, Boston Review, BOMB, Mrs. Maybe, Hi Zero, and elsewhere. The first installment of her three-part play, The Whole Tragedy of the Inability to Love, was presented at the CUNY Graduate Center’s three-day PRELUDE 12 Festival. She lives and works in Brooklyn, New York. TERENCE DEGNAN is a poet and spoken word artist. He’s been published in various literary magazines including The Other Herald, The OWS Poetry Anthology, The Front Weekly, as well as in the anthology “My Apocalypse”. His two spoken word albums (2008’s “BC” & 2010’s “Calling Shotgun” ) were produced in Pittsburgh, PA and Raleigh, NC, respectively. They can be found on iTunes, Spotify, and a sundry of many, more complicated music databases. His book The Small Plot Beside the Ventriloquist’s Grave was released in August (SMP, 2012) He authored the play Unattended Packages, which saw it’s debut in 2007 in New York City and was directed by David Little. Terence was recently named the poetry editor for Sock Monkey Press in Brooklyn, NY. MARTIN KLEINMAN will read Rain from his soon-to-be published collection of short fiction, Home Front. He is a New York-based storyteller that has captivated audiences with his tales of Real New Yorkers in venues from KGB to Brooklyn’s Union Hall. Born and raised in The Bronx, Kleinman has lived and worked throughout New York City and, today, resides in the northwest Bronx, high atop a mountain overlooking the Hudson River. He is honored to have his first reading outside of New York here in Boston. He promises to keep his references to NYC sports teams to a minimum. This entry was posted in Events on March 6, 2013 by smp.